I had the chance to watch the newest Star Trek movie, Star Trek Beyond, at an early screening this past week. I like the new movies. I never watched the shows or the old movies, so I’m coming into Star Trek as a brand new fan. I always enjoy watching the movies, in part because the cast is great, but I find that there is a really persistent problem with movie franchises and developing villains very poorly (looking | at | you, Marvel) and expecting audiences to not mind. I can barely remember the villains for the previous Star Trek films (even amidst the big reveal/controversy with Benedict Cumberbatch as Khan for the last one!) and there’s a reason for that. And I’ll talk about that later. I liked the internal conflicts that we’re presented with in this installment. Captain Jim Kirk (played by Chris Pine) is avoiding celebrating the birthday that officially makes him older than his father lived to see, the same day of his father’s passing. He is starting to lose himself in the routine of his ship and deep space, and is pursuing a promotion that would have him leave the Enterprise. Meanwhile, Spock (played by Zachary Quinto) is thinking about his future after his interactions with Ambassador Spock (his future self, played by Leonard Nimoy, from an alternate timeline). He wants to live his life the way the Ambassador did and rededicate himself to Vulcans, which leads to him and Lt. Uhura splitting up and contemplating leaving the Enterprise himself. You can think of this film as a love story to the Enterprise (which we watch in horror as it is destroyed and crashed) and its crew as our two lead characters struggle with the decision to move on from this part of their lives to the next part. We really get to see a little more from the rest of the crew, which is good given how much Jim is fighting for them – and they for him – for the entirety of the movie. I think the character relations in the movie, while limited, are done really nicely. 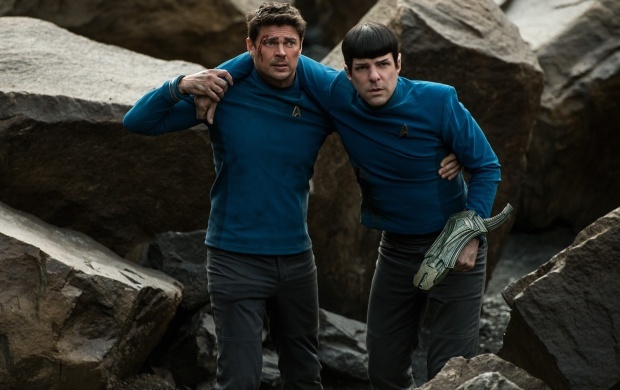 We get this previously not-much-explored bromance with Spock and Bones (played by Karl Urban). With so much focus on the epic bromance that is Spock and Kirk, it was nice to see it mixed up a little bit with Bones, who is an amazingly fun, fiery character, and his contrast with the calm, cool Spock, underscore by both men confessing to the other their utmost respect for one another. 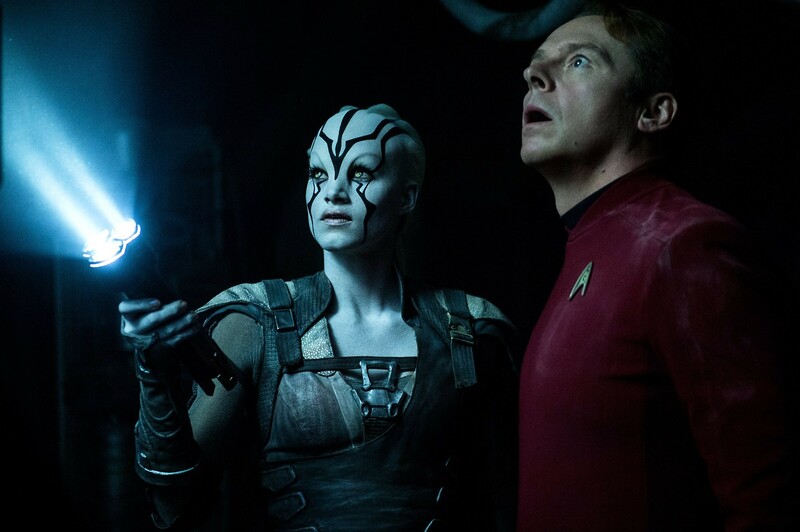 Yes, this is Anton Yelchin’s final Star Trek movie. I was heartbroken when I learned about his death last month, and there’s a small “For Anton” tribute to him at the end. He was one of the younger cast mates, and his presence on- and off-screen will be missed. Goodbye, Chekhov. I nearly forgot that Idris Elba was in this movie until the CRAZY RANDOM REVEAL where Lt. Uhura is watching hundred-year-old footage and sees a half second of his face and then realizes that is our villain. Uhura is kind of amazing for being able to tell that????? From 0.4 seconds of Idris Elba’s face? Why is he so insistent that peace and unity are garbage and that it is only through struggle that humanity can grow? This is coming from a villain who uses swarming ships to destroy everything, I mean how can he be so against unity? Why has he mutated into this alien form? He resembles other aliens on this planet. Are they one species or are they all different species who underwent the same type of transformation? Where did the name Krall come from, exactly? I can understand him forgetting his human self, maybe, through whatever the heck is going on, but where, then, did his new identity come from? And if he has completely forgotten his old self, then what are his motivations driven by? Just an unconscious hatred of the Federation? 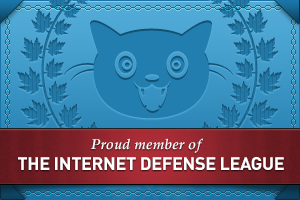 For example, how did they hack Starfleet’s systems and stuff, eh? Not only was our villain kind of very meh (and we don’t even need to bother with the side-villain Manas, who… just… wants to kill people??) but what exactly was the deal with this weapon he was trying to use? It just… destroys people? 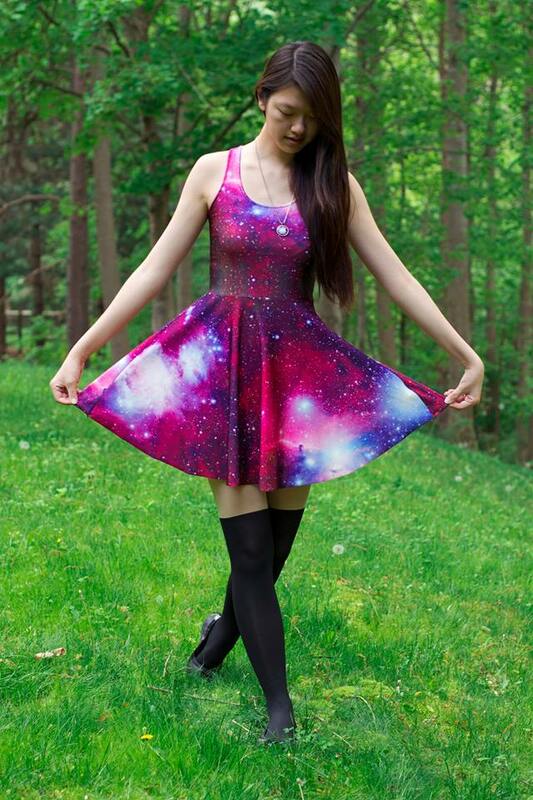 And was hurled into space in the hopes that no one else would find it? What? I don’t… understand…? BUT I really enjoyed visually and thematically watching our gang use the song “Sabotage” to destroy the swarm. That was really cool and, honestly, it’s one of those things that Justin Lin is so good at, just adding drama and humor and stunning visuals into one beautiful climactic scene. Are you planning on seeing the movie? If you’ve seen it, what are your thoughts? Agree/disagree with my mine? I really enjoyed this movie. I’m not a fan of the director Justin Lin and i wish JJ directed this one as well because i really like what he did with the the 2 films of this series. But putting that aside it was a lot better then i thought it was going to be. 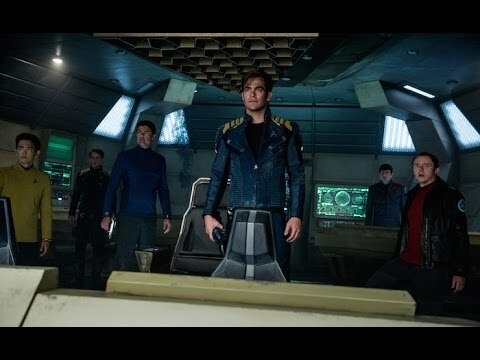 The first trailer of this film made us trekkies really nervous since it looked like a crappy fast and furious movie but in space but i have to say i really loved this movie. I took my mother along with me just to get her out of the house and she hates star trek, i mean she really hates it. I was surprised i talked her into going but anyway after the movie was over i asked her, well how much did you hate it? she said you know what it was a really good movie even though it was star trek lol She laughed at the crews banter and was on the edge of her seat. So i think this is a movie anyone would enjoy even if you never seen the Original series or the other movies. But for die hard trekkies there is always those trekkies who hate everything that doesn’t have the original actors in it or that isn’t just like the tv show so those people will hate this just as they hated the other 2 films. But for someone like me who loves the Star Trek universe i really liked this film. Yes there was some flaws but all movies have flaws life isn’t perfect and neither are films. I agree! It was definitely a really fun movie to watch, even if you’re not a Trekkie, and I hope that the passionate fans enjoyed it, too. It definitely had flaws but I still feel like it was entertaining overall.